Divide the format of the agenda into headings and subheadings to make it easier to read. Collect all information as needed before setting the agenda for the meeting. Organize the format of the formal meeting agenda properly and with signatures before it is circulated to the board members. The formal meeting agenda must also contain the date and time of the meeting and any provisions regarding the adjournments. B) SE Template Received from State On [Date]. C) SE revised plan timeline. D) Interventions and their status [priority item for SE plan]. E) Focus group for conducting this semester [priority item for SE plan]. G) Budget report for the previous year and this year provided by SE. H) Confirming the membership of the SE committee along with the type of committee and the charge of the committee. I) Training for colored men — discussion. J) Full-time faculty diversity hiring for the years [years]. K) Achieving the dream plan presented by [name of the individual]. 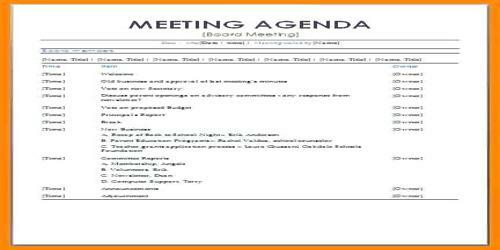 3) Next meeting — [day, date, time and location of the meeting]. 9 AM — Welcome, Introductions And Information Sharing With No Decision Being Needed. 9:15 AM — action plan updates along with a discussion which requires a decision. 10:15 AM — selection of coaches after a discussion with a decision being made. 11:15 AM — ongoing planning of train the trainer event with a discussion which should lead to a decision. 12 PM — evaluate the meeting completely and adjourn for the day.